Let’s learn to accept each other’s differences and celebrate them on November 16—International Day for Tolerance. For once, let’s all make a conscious effort to agree to disagree because whether we like it or not, not everybody shares our opinions, beliefs, and choices—especially about subjects that we feel strongly about. After all, won’t you agree that the world would be an extremely boring place to live in if everybody else has the same thing to say about anything? First things first—before we can even attempt to be tolerant of other people, let’s make sure that we’re on the same page when we talk about tolerance. It simply means a non-judgmental acceptance of a person or a group of people including their racial or ethnic origins, practices, opinions, beliefs, preferences, and behavior, etc.—even if you strongly dislike or disagree with them. This implies that a tolerant person has a fair and objective attitude that’s permissive toward those who are completely the opposite of who and what that person stands for. In other words, there is no place for bigotry in a room full of tolerant people. Perhaps you’re having a hard time dealing with your annoying co-worker or your noisy next-door neighbors who throw wild house parties with guests arriving in the wee hours of the morning. If that’s not enough, in a few weeks, you’d probably find yourself eating turkey with relatives you could hardly stand. The point is, learning how to deal with people we don’t like is a skill that we all have to acquire. Did you know that human beings aren’t ever born intolerant? For example, kids at the local playground couldn’t care less about other kids’ gender, skin color, or the way they talk or dress. However, as we get older, we develop learned concepts of what “normal” looks like, and anyone who doesn’t fit the bill challenges our own sense of “safety.” What we seem to forget is that no matter how blatantly different we are from those persons we dislike, we still share the common bond of humanity. Not only that, if we maintain a tolerant attitude toward each other, we open doors for honest communication, creativity, innovation, and—above all—growth. Working on changing your mindset will cause you to be more comfortable with yourself and less sensitive about disagreements with people who are totally different from you. 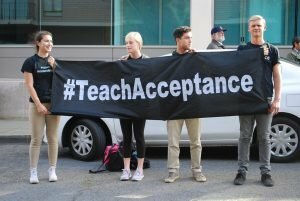 To mark November 16—International Day for Tolerance, we at Veteran Car Donations have come up with four useful tips that are guaranteed to help you change your perspective on how you view things and appreciate differences with other people. Jumping to conclusions won’t get you anywhere because if you’re trying to develop a more tolerant attitude, the first thing you need to remember is that everyone wants to be heard. You need to resist the urge to reject what they’re about to say as soon as they attempt to get their point across. If you don’t understand what they’re trying to tell you, you can politely ask them questions. Remember that different people have different backgrounds and experiences to draw on. What may be obvious to the other party may be strange to you. It would really help if you try to understand where the other person is coming from and empathize with them. We’re talking about changing your mindset—not switching over to your least favorite person’s thinking. The truth is, you can learn from people who are completely unlike you. The sooner you realize and accept the fact that we’re all different, the sooner you’ll develop an outlook that’s more tolerant than what you currently have. Being tolerant of others means being mature enough to admit that we live in a world where each person is unique. If you have a tolerant attitude, you can still manage to appreciate other people despite the differences. More importantly, you demonstrate empathy, understanding, and respect. Another awesome thing you can do on November 16—International Day for Tolerance is to extend a helping hand to the struggling and impoverished veterans in your area by donating an unwanted vehicle to us at Veteran Car Donations. We will auction off your donated vehicle and use the proceeds to provide vital assistance to those veterans and their families who are burdened with poverty, disabilities, physical and mental health issues, unemployment, and homelessness. The funding will go to our nonprofit partners whose mission is to provide them with mortgage-free and specially adapted homes, physical and mental health care, job opportunities, education scholarships, and other benefits. What’s special about our car donation program is that you, too, will benefit from your charitable contribution since this will entitle you to receive the highest possible tax deduction after your vehicle is sold. Make November 16—International Day for Tolerance as a day to show your gratitude to our nation’s heroes for what they have done for our country—safeguarding our liberties and protecting our nation’s security. Call us at 877-594-5822 and get free professional towing service for your car donation.